It has been a long hot Summer this year. Made even longer by the mild Spring. As we approach the end of summer and the Autumnal Equinox on September 22. I decided to change what I had planned for Assignment 21 and ask you to submit photos showing me what constitutes the end of summer to you. Using your creative and imaginative minds and photographic talent and know how, create NEW photos showing me how you view and feel about the end of summer. Clouds, waves and a sign indicate, for this Lake Ontario beach, summer is over. A Lake Ontario beach closed for the season and ending summer’s fun. For this assignment I will be randomly selecting one (1) contributor to win Scott Kelby’s Digital Photography Boxed Set with all Four (4) volumes. If the winner already has these books, I will substitute a $50 Amazon.com Gift Card. As in the other assignments, do not send me your photos. What I would like you to do is post them on your blog, flickr, Google+ or other photo sharing site, personal website or any place on the Internet where you can place a link to it here by making a comment to this blog entry. Then, we can all visit those sites and enjoy everyone’s End of Summer photos. Please, have your photos posted on or before Midnight (your time zone), Wednesday, September 26, 2012. Might be a good time to start up a blog or join a photo community like flickr. As I have done for all the Assignments, I will put together a recap with my comments. If you have any questions, leave me a comment and I will be happy to answer them. I would doubly appreciate it if you would help spread the word about this assignment so we can get lots of people to participate. Blog it, Tweet it, FaceBook it, Google+ it, Pin it, Tag it, email it and talk about it to your fellow photographers, bloggers, friends, strangers on the street and family. Thank you! This entry was posted in Assignments and tagged beach, beach closed, boat, clouds, great lakes, hdr, Lake Ontario, lifeguard, new york, photomatix, rocks, sign, stand, water, waves. Bookmark the permalink. This is a very good and dramatic photo, I wonder if you have changed the colors a bit or if the weather really was like this? Anyway it doesn´t make one feel like to stay at the beach much longer, a warm blanket and a good book seems to be a good alternative. About the assignment, I´m in, – of course. The scene is enhanced by using HDR processing. Otherwise the sky and most of the water would have looked horrible in a single photo. Happy to hear you will participating! 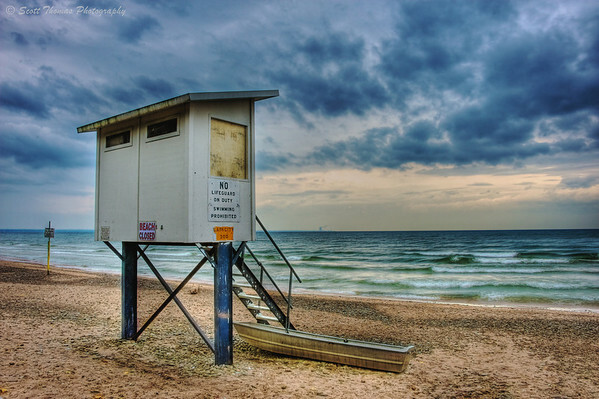 The beach photo is great….such a sense of isolation…can hear the song “Boys of Summer” playing in my head. What an amazing photo Scott. Are the colours “re-jigged”.? The blues are freaky and beautiful. I’m OK with the end of this summer. Too hot for me. I’m in. Thanks for the challenge. Scott, talk about getting in under the wire … just finished my end of summer post. Phew. Oh, I know you can and it will be full of feeling, too. Thank you for the link back! Welcome, Joanne! Feel free to participate and show your seasonal transition into summer. Hi Scott ! Here is my contribution to your assignment. I enjoyed it, thank you. It was the early signs of fall with a little bit of color, but they had mowed down the meadow (which was the playground for all kinds of insects and creatures). This was also taken on one of our last 80 degree days. So yes the end of summer. I took three pictures and put it through my HDR, photomatix software. Pretty good odds so far for the posters of winning the books/gift certificate. Thank you for another great challenge with this Assignment! Scott, this is my contribution to the assignment. I’ve spent the last several weeks looking for “End of Summer” and all I was finding was “Beginning of Fall”. Which is fine for me – autumn is my favorite season! – but didn’t provide any photographic inspiration. Besides, who could compete with your’s and Deb’s entries? I just saw that I won…..yipppeeeee Thank you Scott!!!!!!! I am so excited! !